According to myth, Zeus released two eagles to circle the world and in their flight they crossed above Delphi – the center of the Earth. Delphi is an expansive site on the side of Mt. Parnassus with sweeping views and layers of ruins to explore. 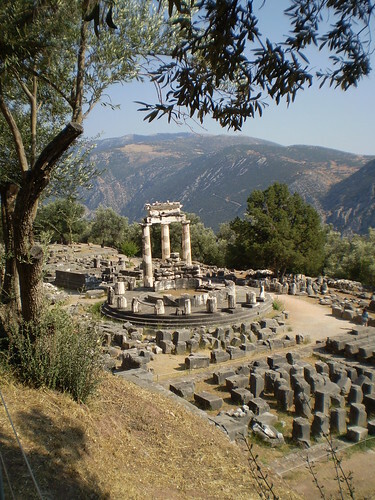 Delphi is perhaps most famous for the Oracle at the Temple of Apollo. The heart of the temple was situated over a crack in the ground which spewed noxious gas. Under its influence and perhaps other substances, the temple priestess would speak which in turn was “interpreted” by the savvy and current events-conscious temple priests. Pilgrims, diplomats and kings came to Delphi for this divine advice which was not always so clear. On his second consultation regarding the impending Persian invasion, Themistocles of Athens was told famously (in cryptic oracle language) that “Though all else shall be taken, Zeus, the all seeing, grants that the wooden wall only shall not fail.” After the Persians captured and burned much of Athens, it was the decisive Greek naval victory near Salamis that sent the Persians back home. It seems the Oracle’s “wooden wall” was not a city wall but a fleet of ships! As you would imagine, the Athenians were elated after their victory and most likely brought fine sculptures and gold to the Apollo in thanks. This is actually what every Greek city-state did after a victory storing the offerings in their own dedicated Treasury building. The road leading to the Temple of Apollo is lined with Treasuries which acted like both a museum and a bank vault meant to show off the generous gifts of the city to Apollo and to protect the objects. Today only the Treasury of Athens remains complete after extensive restoration. At the site today, you can see up the mountain to the Temple, but during the Classical Greek period, the view must have been obstructed with a winding street of proud, glittering Treasuries. 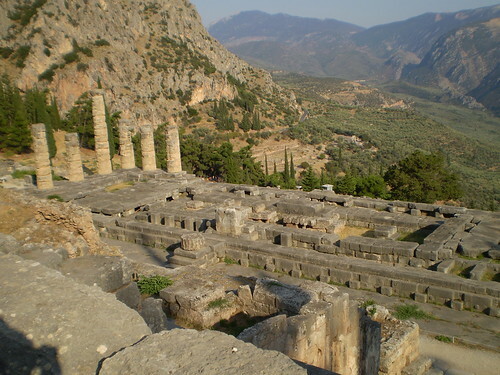 Delphi hosted the Pythian games every four years for about 900 years beginning in 582 BC. Since the games focused more on arts, there is a well preserved theater in addition to a stadium for athletic competitions above the Temple of Apollo. The modern road through Delphi cuts the Treasuries, Temple and event venues from the lower portion of the site. Here you’ll find an athletic training grounds and a large temple complex dedicated to Athena – Apollo’s sister. 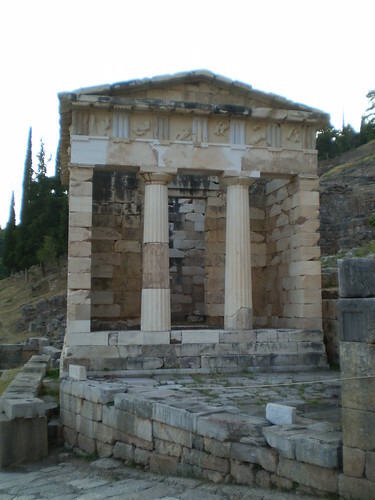 Beside the main Temple is the elegant round Tholos building which is usually (and incorrectly) associated with Apollo, the Oracle and Delphi in general, because of its beauty. If there is not a picture of white and blue buildings from Santorini on the cover of your Greek guidebook, then it is probably a picture of the Athena Tholos at Delphi! Delphi does have a small museum which contains some sculptures and architectural elements from the ancient site. 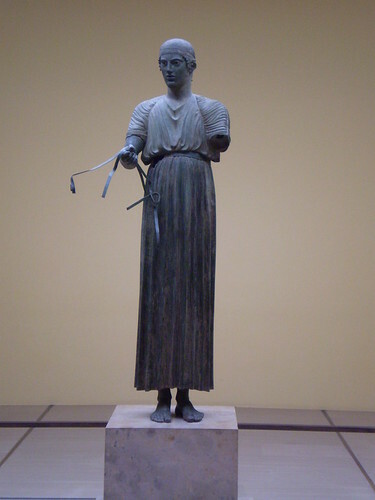 The most notable piece is the bronze Charioteer which survived because it was buried during a landslide. The figure is elegant, youthful and executed with great detail. Since the modern world has inherited Roman stone copies of now lost Greek statues, we often forget that bronzes constituted about half of the ancient Greek statues. I have a lot of travel tips for seeing Delphi so I’ll post those separately. In the meantime, let me say that Delphi is an impressive sight – well worth the trip and greatly enhanced by some historical background before you visit. Good Blog! I have just returned from a holiday in Greece and articles like this make me want to turn straight round and go back! Thanks! Me too 🙂 Is it time for another holiday yet? It is always the right time for another holiday!